Experts estimate that as many as 24 million Americans have a clinically significant eating disorder. Both genders develop these disorders, but they are more common in females. Medical professionals recognize three different types of eating disorders: binge eating disorder, bulimia nervosa and anorexia nervosa. While all three types can have serious health consequences, bulimia and anorexia are more likely to affect oral health. Bulimia causes acid erosion on teeth, mouth sores, and other problems while anorexia may weaken oral bone structures. In 2013, the definitions of eating disorders were revised. Diagnosis of binge-eating disorder includes repeated episodes of eating very large amounts of food without attempts such as self-induced vomiting or laxative use to prevent weight gain. Binge eaters may feel out of control or suffer feelings of shame or guilt for their behaviors. Eating when not hungry, eating to the point of physical discomfort or eating alone are common. Anorexia nervosa, the most immediately life threatening of the disorders, has the highest mortality rate of all psychiatric conditions. Victims often adopt extreme diets or refuse to eat. The self-starvation leads to emaciation and a number of serious medical complications. People with anorexia have a distorted body image and an intense fear of gaining weight. Bulimia nervosa manifests similar symptoms but also includes self-induced vomiting after eating to prevent weight gain. Often the first person to recognize signs of an eating disorder is the patient’s dentist. Bulimia effects on teeth are caused by frequent exposure of enamel to stomach acids contained in vomit; acids erode tooth enamel rapidly and lead to cavities, tooth discoloration, and tooth loss. Bulimic teeth usually have a worn appearance and a yellow tone. In anorexic individuals, starvation leads to osteoporosis, which can weaken the bones that support teeth and cause tooth loss. 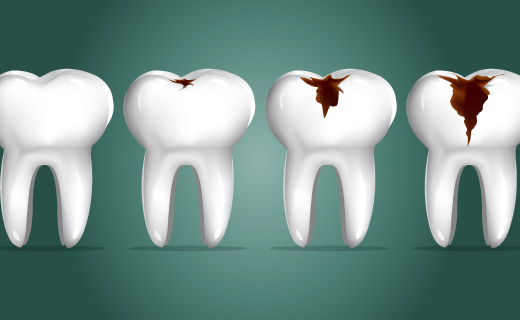 Acid erosion on teeth and other anorexia and bulimia effects on teeth can be corrected with cosmetic dentistry, but treating the underlying condition is essential for restoring health and preventing serious medical complications.